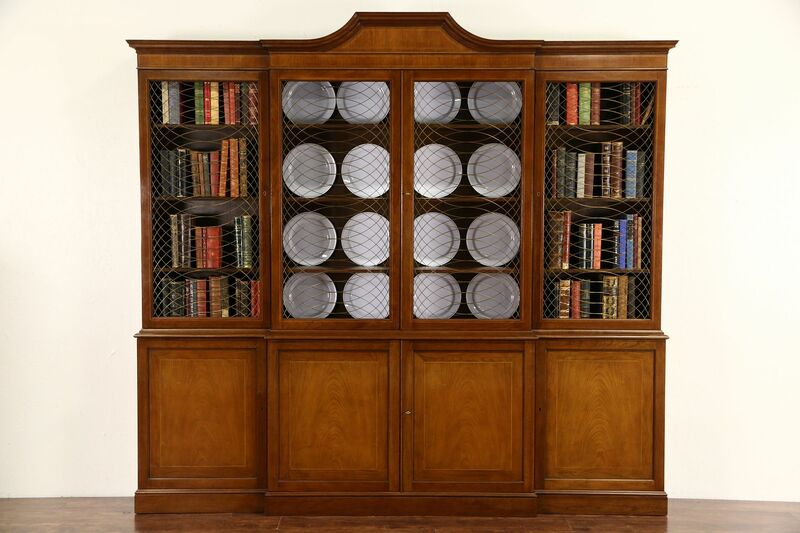 Signed by premier maker, "Baker," this cherry library bookcase or breakfront china cabinet is about 30 years old. The satiny finish is in extremely fine condition with subtle distressing and only very minor mars at the edges. Delicate inlaid banding is authentic on this American made vintage furniture. Three separate banks of shelves are adjustable. Brass grill work in the doors is original, doors have working locks. The upper section is removable for easier moving. Dimensions are 8' 1 1/2" wide at the crown, 15" deep and 7' 6" tall, the base is 33" high.